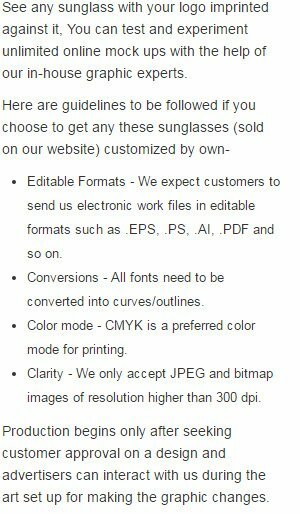 Custom Printed Neon Oahu Sunglasses - Assorted Colors will look amazing with your logo and thus you can easily upgrade your brand image among people. These custom Oahu sunglasses has UV400 protection and are having a good imprint area of 2" x 3/8" which can expose your brand well. One size fits most adults; these custom sunglasses are made available in 14 color options. Place your order at the earliest to grab our free digital proofs and free artwork design services. Request a quote to know what you can save on ordering these Custom Printed Neon Oahu Sunglasses - Assorted Colors in bulk. Delivery Time is Based on the mode of shipping chosen.